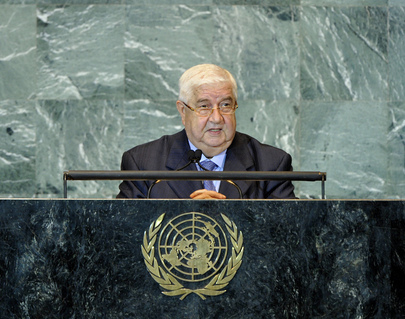 WALID AL-MOUALEM, Minister for Foreign Affairs and Expatriates of the Syria, said that the positions and circumstances of States were governed by their geopolitical realities and by the constraints and demands stemming from them. As a State in the heart of the Middle East, for many decades, Syria faced major challenges and stood firmly against attempts to curtail its role and divert the national course it had chartered for itself. It was no secret that Syria had upheld its national sovereignty and the independence of its decisions. Meanwhile, it had spared no effort in supporting the legitimate struggle of the Palestinian people and championed resistance movements. Syria upheld its right to liberate the Syrian Golan to the lines of June 1967. At the same time, Syria extended a hand of friendship to all States and built its national relations on mutual respect and reinforcing interests. It used its leverage to serve and promote the centrepiece of Syrian national prerogatives, namely the Middle East question to liberate land and restore rights. Following the occupation of Iraq, Syria was dragged into another battle in which it had to choose between enduring the siege and isolation or submitting to dictates. Again, it summoned its will to prevail, and emerged stronger and having preserved its independence and national prerogatives. There were two sides to the problem Syria faced today, he stressed: on the one hand, the country needed people-driven political, economic and social reforms. But, the force of political circumstances demanded that domestic priorities take a “back seat” to other priorities. The overriding priority was to deal with the external pressures facing Syria, he said, which were at times tantamount to “blatant conspiracies”. On the other hand, popular demands had been manipulated to further objectives that were alien to the interest and expressed desires of the Syrian people, he continued. Those demands were stepping stones used by armed groups to sow discord and sabotage Syria’s security, he said, adding that they became the “new pretext for foreign intervention”. Syria had exercised its responsibility to protect its citizens. However, vigilance against the continuing threat of foreign intervention did not mean underestimating popular demands. Many of those demands, in his view, had already been met. Reforms were a “work in progress”, which would continue through national dialogue. In that regard, he recalled a statement made by President Bashar Al-Assad on 20 June 2011, in which he declared reform measures comprising new laws. Among those were an Information Act to lay the groundwork for free and independent media, a Political Parties Act to guarantee pluralism, a Parliamentary Elections Act and a Local Administration Act. The President also announced a timeline of no more than six months to agree on and implement those proposed reforms. Syria deeply regretted the surge in the activities of armed groups, which were the manifestation of foreign intervention. However, he said, it had expected the States advocating the need for reform to support the Syrian official position, instead of “incitement and defiance”. Further, the armed violence was surging in tandem with multiple economic sanctions. That course could not in any way be reconciled with the pronouncements of concern for the interests, security and rights of the Syrian people. It ran counter to the basic principles of human rights, in defence of which, States based their interference in Syria’s nternal affairs. In fact, he stressed, any objective analysis of the events in and around Syria would demonstrate that the purpose of the current anti-Syria campaign was to attack the model of coexistence that had been a source of pride to its people. He asked: what else could that course achieve other than spreading Western hegemony and serving Israel’s expansionist interests? From the rostrum today, he called on States that had partaken in that unjust campaign to reconsider their positions. Finally, he said that Syria considered the international community’s pursuit of the recognition of Palestinian statehood to be legitimate. It was a positive step, he added, calling on all Member States to support that request. Regarding the Middle East nuclear-weapon-free zone, Syria’s position was established and well known. It continued to call for exercising pressure on Israel to implement international resolutions that had called on it to accede to the safeguard regime of the International Atomic Energy Agency (IAEA).